Very variable small tuberous perennial. Broadly heart-shaped, usually glossy dark green leaves which often have markings of paler green, silver or bronze. The leaves die back soon after the brilliant golden yellow flowers appear in early spring. A common wildflower, sometimes considered an invasive weed but rarely a serious nuisance as the top growth disappears by early summer. There are a number of selected forms in cultivation. Not very fussy but prefers moist soil and a little shade. 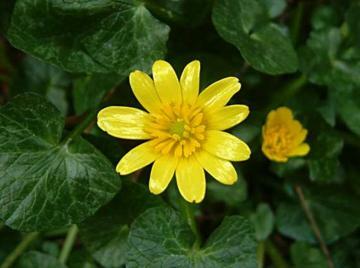 Thrives in woodlands, hedgerows and stream banks. Can form extensive patches. Spreads prolifically by tuberous roots and seed. Early spring colour in the woodland and wild garden. A widespread native of Europe, North West Africa and South west Asia.